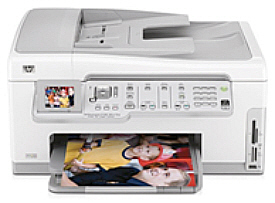 The Photosmart C7280 is a competitively priced all-in-one printer/photocopier/scanner/fax machine. When space is an issue in your office or home, it makes sense to choose office equipment that combines printing, photocopying, faxing and scanning. The Photosmart C7280 All-in-One is ideal for your Virtual Assistant home office, with fast, quality, reliable printing and copying. The Photosmart C7280 incorporates OCS software and built-in fax functionality, with wireless network capability. The paper tray takes 100 sheets and the photo tray can take up to 20 sheets. Up to 90 faxes can be stored in the memory. Images from a camera or memory card can be transferred using Photosmart software - part of the HP Solution Centre. The inkjet printer uses 4-6 individual cartridges and prints, 9 black and white pages per minute, and 8 colour pages per minute. The maximum scanning resolution is 4800 x 4800 dpi. And the maximum print resolution is 4800 x 1200 dpi. This produces exceptionally sharp colour images and solid blacks. In essence, the Photosmart C7280 is good value for money.